This clip is favorited by 5 people. Reflections with Fr. Bert Akers, S.J. - "Pray for Generosity"
Commercial: WBMX 102.7 FM - "More in '84"
This aired on local Chicago TV on Wednesday, February 22nd 1984 at around 5:50am. Comment posted by ChitownTVFan on Sunday, April 4th 2010 at 2:44am. I thought Ronny and the Daytonas sang G.T.O. Did the Beach Boys record it first? Comment posted by smctopia on Sunday, April 4th 2010 at 8:43am. Comment posted by FuzzyMemories on Sunday, April 4th 2010 at 10:57am. The audio tone heard up to 1:07 was set at an average of 393.8 Hz. As for the sign-on and PSA voiceover, it was Janice Kos. Comment posted by W.B. on Sunday, April 4th 2010 at 11:55am. Thanks for this, Fuzz. Nice to hear a tone to go with the TP - the YouTube WLS sign-on had no tone in them. @W.B. (or anyone) : As we see the EIA (right?) color bars in the first few seconds of the clip before switching to the circular TP, would you happen to know if WLS ever retired the circular TP and used the EIA or even SMPTE designed bars until they stopped signing off/on for good in the early to mid-90s? Or did they just keep using the faded circular one until 24/7 programming? Did other O&O's use these bars or circular designs as well? When did they go 24 hours a day? Comment posted by Tim on Sunday, April 4th 2010 at 6:22pm. Again you're scaring me. Bars and tone fans?! Comment posted by telefrank on Sunday, April 4th 2010 at 8:12pm. First up, that circle 7 was exactly as used since the last 5-6 years as WBKB(-TV) and carried over to after the 1968 call sign change. As for the EIA bars (and yes, they're EIA all right - just curious as to which generator WLS used), the shape looks almost the same as on a YouTube clip of a 1986 sign-off of WNBC Channel 4 in New York. - New York's WABC used a circular TP design as on the YouTube clip link above. - In the late 1960's and early '70's, WMAQ Channel 5 had a test pattern design unique to NBC O&O's, almost exactly as on this vidcap, except the top center left had "WMAQ-TV 5" and the bottom center right had "CHICAGO" printed. - In Cleveland, then NBC-owned WKYC Channel 3, from the late 1960's until about the early mid-'70's, had the exact test pattern design as on WLS's "Circular Polarization" pattern; as laid out on this screengrab, you get an example of what the colors of the WLS pattern would've looked like at the outset before fading set in. 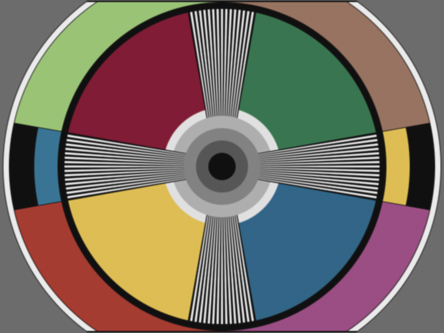 - In the 1970's, WNBC Channel 4 had a custom color test pattern using the circular design. While the logo itself is not on this recreation (three variants of which were used, right up to its last use around the late 1980's), here is how the colors were basically laid out. If one weren't careful how the slide was positioned, viewers could actually see the "COPYRIGHT 1947 - NATIONAL BROADCASTING CO. INC." notice directly below the pattern. - Someone noted that KABC in Los Angeles had a B&W circular pattern. - Cut from color bars to circular pattern 2 minutes before sign-on. - Cut out tone 1 minute before sign-on. - Cut to black 10 seconds before sign-on. Notice on here, "sign-on" was the moment the "SSB" came up. - Cut from color bars and tone to WMAQ-TV slide 2 minutes before sign-on. - Cut to black 45 seconds before sign-on. Oh, and as I've said, the voiceover on this sign-on and PSA was Janice Kos. Comment posted by W.B. on Sunday, April 4th 2010 at 8:24pm. Was this on a tape that had some footage on the short-lived Tele1st channel? Comment posted by betamax75 on Sunday, April 4th 2010 at 8:24pm. Comment posted by W.B. on Monday, April 5th 2010 at 7:40pm. Was this following an overnight block of the ill fated Tele1st. pay service? Comment posted by dth1971 on Monday, April 5th 2010 at 9:29pm. This would've probably been from within the time frame that this "Tele1st" was tried out on overnights. Comment posted by W.B. on Monday, April 5th 2010 at 11:38pm. Comment posted by HUdson 3-2700 on Tuesday, April 6th 2010 at 10:33am. @telefrank: Oh yeah, bars and tone! @WB: What's your background? Your technical knowledge is great! Comment posted by HUdson 3-2700 on Tuesday, April 6th 2010 at 10:38am. First, I have equipment to measure tone frequencies. Secondly, I am one of many who from time to time used to stay up all night and into the morning, seeing TV stations sign off and then sign on . . . and paying as close attention as I could. Comment posted by W.B. on Tuesday, April 6th 2010 at 11:53am. Comment posted by 69TH&STONY on Saturday, October 30th 2010 at 4:30pm. For everyone who was wondering, the piece that leads "Reflections" in and out is the beautiful suite from Peer Gynt called "Morgenstimmung" or "Morning Mood," by Edvard Grieg. Knowing that, I think this piece was an excellent and appropriate choice! Comment posted by AnnArborMI90 on Saturday, May 26th 2012 at 1:41pm. @ER3017 - I believe AnnArborMI90 answered that in a previous comment. Comment posted by FuzzyMemories on Friday, February 22nd 2013 at 7:30am. This was preceded by a block of cooking shows on Tele1st; here's some excerpts (including the end of Tele1st and transition to "regular" WLS-TV). That and this sign-on were accidentally recorded by Szake when he mixed up the AM/PM indicator on his VCR. Comment posted by IAmNomad on Monday, February 25th 2013 at 1:30am. The company that offered (for sale, of course) this color test pattern (and laid out the type including the "Broadcasting From Sears Tower" and "Circular Polarization" notices) was a Clifton, NJ firm called Tele-Measurements, Inc., which is still around. In 1977 adverts the company put out in magazines such as Broadcast Engineering and BM/E (Broadcast Management/Engineering), their designation for this type pattern was TM-501, as part of their "Tele-Pat" line. A much earlier version of this pattern was used in Chicago by WFLD Channel 32 in its early years on the air (from its 1966 debut into the early '70's, apparently giving way to electronic color bars around the onset of Kaiser's 1973-77 sojourn). Comment posted by W.B. on Thursday, November 26th 2015 at 5:36am. This clip has been viewed 15946 times. This clip debuted on FuzzyMemories.TV on Saturday, April 3rd 2010.